Pulsar Instruments Model 14 is an entry-level sound level meter for general purpose use whilst meeting the requirements of IEC 61672 to Class 2. It is also an ideal low-cost instrument for those applications where a Sound Level Meter can be useful but a high specification instrument would be too expensive. A maximum hold function allows the unit to freeze the display showing the highest level measured. This can be used where the allowable level is given in terms of a maximum (LAFmax or LCFmax). The 'A' weighting filter is the internationally recognised method of replicating the response of the human ear to noise, making the Model 14 the ideal tool for basic noise risk assessments. 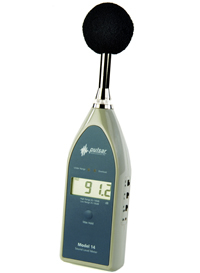 The instrument can be calibrated for compliance, using the Model 106 Acoustic Calibrator, when used for industrial noise checks. Two measurement ranges are included in the Model 14, measuring the most typically encountered levels from 35dB(A) to 130dB(A). The Pulsar Model 14 is the perfect solution for basic industrial noise surveys, and ideal for use in the measurement and checks of vehicle noise, workplace noise, fire alarms, audible warning systems and during the installation of sound systems.